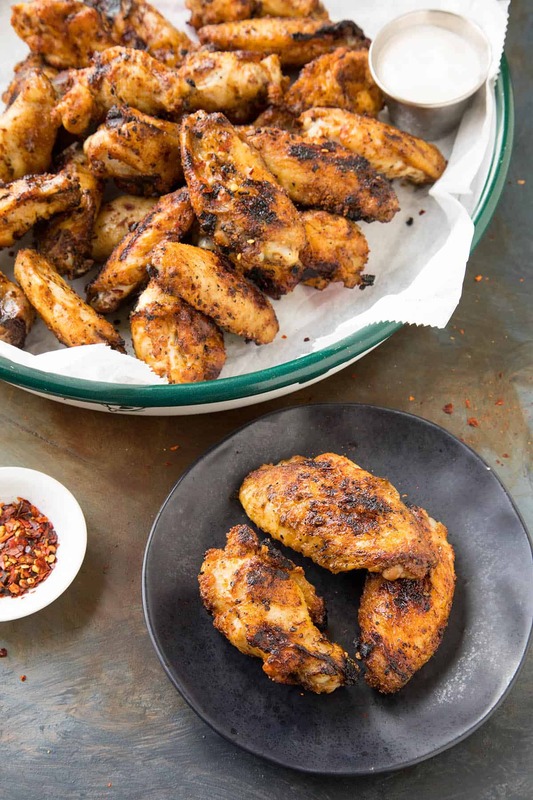 A recipe for spicy grilled ghost pepper chicken wings that have been rubbed down with a vibrant mix of ghost pepper flakes and other seasonings, then grilled to crispy perfection. Fire up those grills and get cooking. For true spicy food lovers. These “no sauce” hot wings will keep you at home and will save you a ton of cash, as you won’t need to run out to your local wing joint. Excellent! Don’t get me wrong. I LOVE running down to one of the many local chicken wing establishments near my home, but there is something special about making them at home, especially when I’m in the back yard, firing up the grill. FAVORITE THING! I love grilling! We have a nice backyard that backs up to a pond and it’s rather serene. I can enjoy a nice adult refreshment as I let my chicken wings SIZZLE on the grill grates. The rub is simple – ghost pepper flakes, dry seasonings – but the grilling gets them extra crispy. Let’s talk about how we make them, shall we? It’s SUPER EASY. 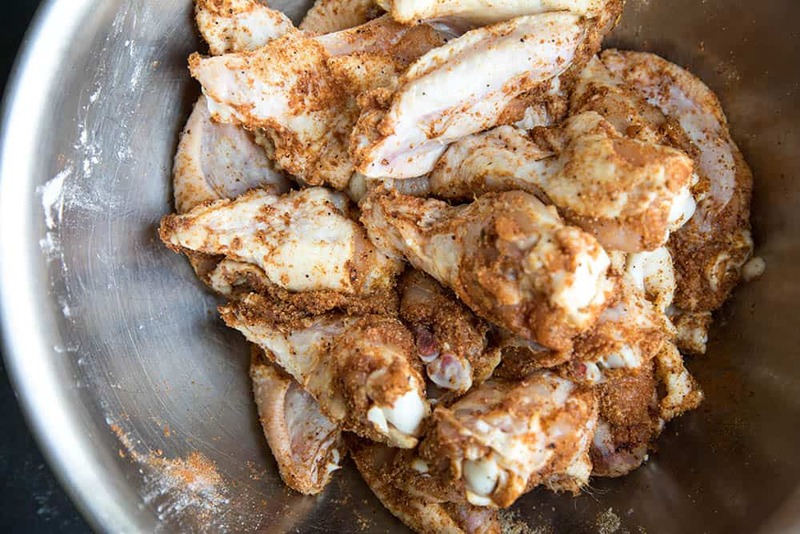 First, pat the chicken wings as dry as possible, then add them to a large mixing bowl. 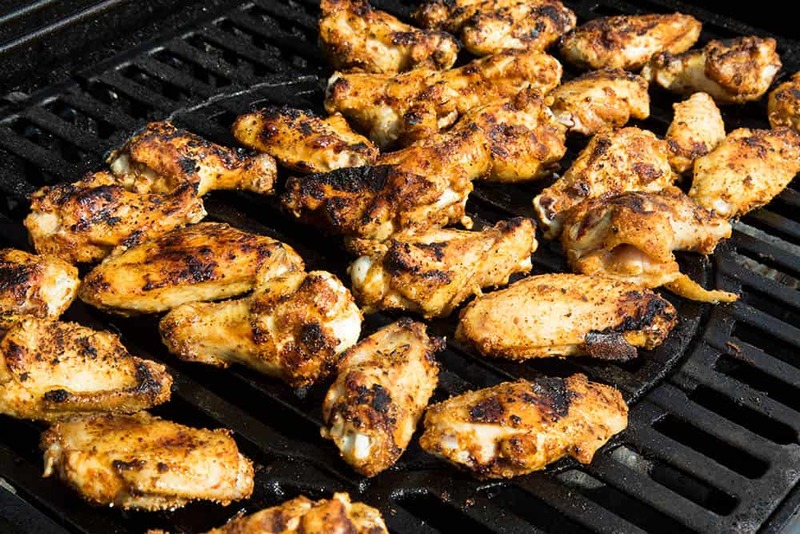 Be sure to remove the wing tips, as those will just burn on the grill. Next, sprinkle in your seasoning mixture, including ghost pepper chili flakes, chili powder, paprika, garlic, onion powder and salt. 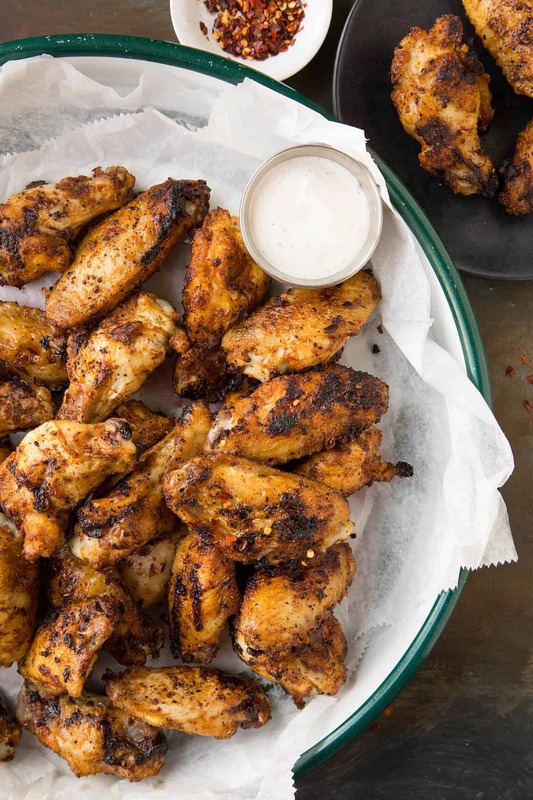 Give them a nice toss to make sure all the wings get nicely covered with your dry seasonings. Cover the bowl and refrigerate the chicken wings for at least 1 hour. This ensures the seasoning intensifies, but also helps the wings dry out even further before grilling them. This the primary secret to “crispy” wings on the grill. Dry chicken skin. The drier the skin, the crispier they will turn out. When you’re ready for grilling, fire up the grill to medium-high heat. Sprinkle the chicken wings with a bit of olive oil, then set them onto the grill grates. The combination of dry skin, high heat and olive oil will add to the overall crispiness. Grill the chicken wings for 30-40 minutes, flipping them occasionally, until they are cooked through and the skins are nice and crispy. I like to blacken my wings, as you’ll see from the photo, but you can lower the heat and cook them a bit more slowly for less char. Serve them up with a bit of ranch or blue cheese dressing on the side, if desired, or just gobble them up! Very Dry Chicken Skin. Pat the chicken skins as dry as possible with paper towels before grilling them. It helps to sprinkle them with salt afterward and set them into the refrigerator. This helps draw out the moisture from the skins, which you can wipe off again. Baking powder is another secret ingredient that can help draw out the moisture from chicken skins. Additionally, the environment in the refrigerator helps dry the skin out even further. Try leaving them in the fridge overnight, covered, and see how dry they get. High Heat. You won’t get as hot as fry oil, but a high temperature in combination with your oil run before grilling will really help crisp up that dry skin. Oil. I use an olive oil blend typically, but you can use any neutral oil, such as vegetable oil, peanut oil, or avocado oil. Try them all! As with most ghost pepper recipes, you’ll notice a HIGH heat factor that starts off with a mild burn and slowly builds. Ghost peppers are an original superhot chili pepper, topping 1 Million Scoville Heat Units (SHU), so expect a very respectable level of heat. OH YEAH! You probably will only notice a bit of heat with the first couple of wings, but after a good 8 to 10 of them, oh yes! Pleasant heat. 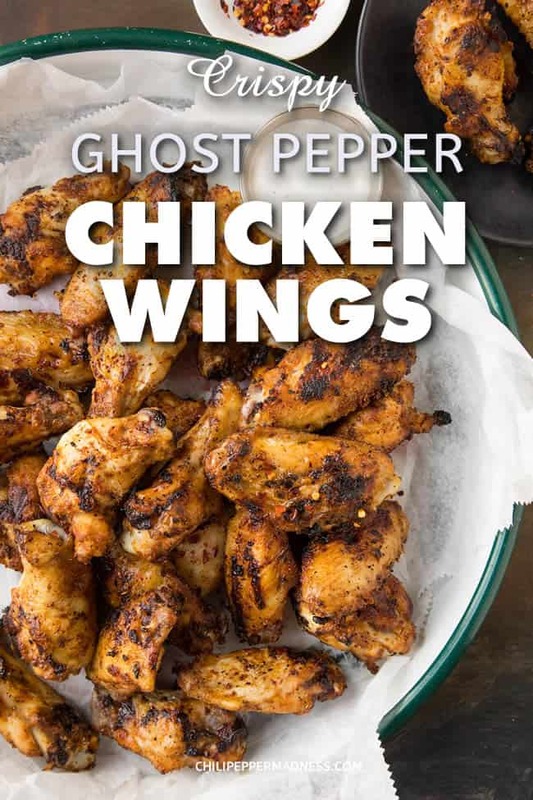 Add chicken wings to a large mixing bowl and sprinkle them with the ghost pepper flakes and other dry seasonings. Toss until they are well coated. Preheat your grill to medium-high heat. 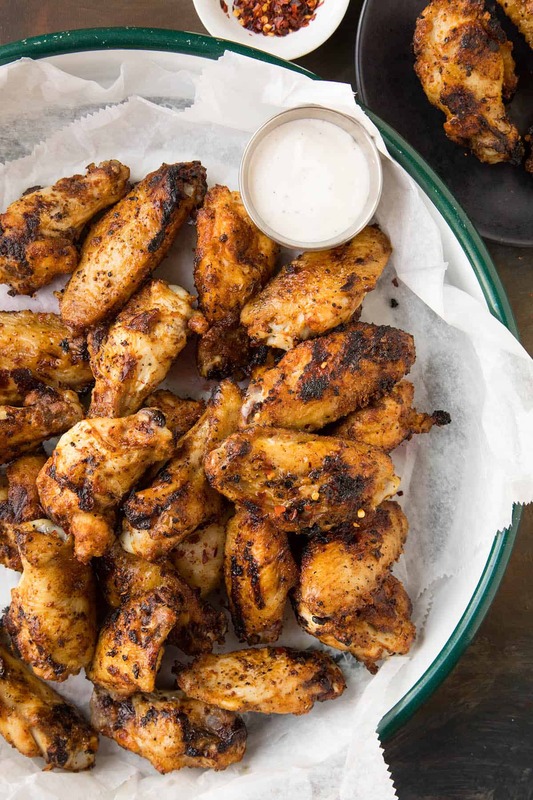 Toss the seasoned chicken wings with olive oil. Grill the chicken wings for 30-40 minutes, flipping occasionally, or until they are nicely cooked through. Heat Factor: HOT. You'll get some excellent level heat from the ghost pepper chili flakes. Reduce the heat by omitting the ghost pepper flakes and focusing on the spicy chili powder. This recipe was originally posted on 6/6/2014. It was updated on 7/19/2018 to include new photos. Just made these and they were just the right amount of spicy. Ghost peppers all the way. Thanks, Joey. Ghost peppers are one of my favorites. My husband would love these! The hotter the better! Thanks for sharing.